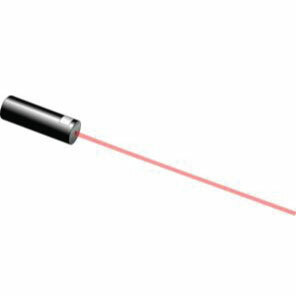 A laser is a high power light that has been harnessed to create a narrow directional beam of light. Laser light can be visible or invisible. Light can be UV light, invisible infrared light or visible light that we see. Light consists of many wavelengths, laser light consists of one wavelength. 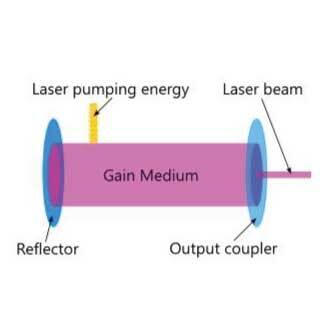 The basic components of any laser include a gain medium in an optical cavity, reflecting mirrors at either end, and laser pumping energy in the form or either photon or electrical current. The gain medium (also called lasing medium) consists of a group of atoms, molecules, or ions in solid, liquid or gaseous form, which acts as an amplifier for light waves. For amplification, the medium has to achieve population inversion, which means in a state in which the number of atoms in the upper energy level is greater than the number of atoms in the lower energy level. The output coupler serves as the energy source which provides for obtaining such a state of population inversion between a pair of energy levels of the atomic system. When the active medium is placed inside an optical resonator, the system acts as an oscillator. An optical cavity, resonating cavity or optical resonator is an arrangement of mirrors that forms a standing wave cavity resonator for light waves. Optical cavities are a major component of lasers, surrounding the gain medium and providing feedback on the laser light. They are also used in optical parametric oscillators and some interferometers. Light confined in the cavity reflects multiple times producing standing waves for certain resonance frequencies. The standing wave patterns produced are called modes; longitudinal modes differ only in frequency while transverse modes differ for different frequencies and have different intensity patterns across the cross-section of the beam. Laser pumping is the act of energy transfer from an external source into the gain medium of a laser. The energy is absorbed in the medium, producing excited states in its atoms. When the number of particles in one excited state exceeds the number of particles in the ground state or a less-excited state, population inversion is achieved. In this condition, the mechanism of stimulated emission can take place and the medium can act as a laser or an optical amplifier. The pump power must be higher than the lasing threshold of the laser. Optical pumping uses light to create the necessary population inversion for a laser. Usually, high-pressure xenon or krypton lamps are used to excite solid or liquid laser systems. The active material in the laser absorbs the light from the pump lamp, promoting the population from the ground state to the higher energy state. The material used in the laser can be continuously exposed to the pumping light which creates a continuous wave laser (CW). A pulsed laser can be created by using flashes of pumping light. Electrical pumping is a much more complicated process than optical pumping. Usually used for gas and semiconducting lasers, electrical pumping uses electrical current to excite and promote the ground state population. In a simple gas laser that contains only one species (A), current passes through the gas medium and creates electrons that collide with the gas molecules to produce excited state molecules. A laser oscillator usually comprises an optical resonator (laser resonator, laser cavity) in which light can circulate (e.g. between two mirrors), and within this resonator a gain medium (e.g. a laser crystal), which serves to amplify the light. Without the gain medium, the circulating light would become weaker and weaker in each resonator round trip, because it experiences some losses, e.g. upon reflection at mirrors. However, the gain medium can amplify the circulating light, thus compensating the losses if the gain is high enough. 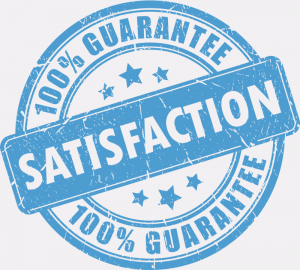 The gain medium requires some external supply of energy – it needs to be “pumped”, e.g. by injecting light (optical pumping) or an electric current (electrical pumping → semiconductor lasers). The principle of laser amplification is stimulated emission. Figure 1: Setup of a simple optically pumped laser. The laser resonator is made of a highly reflecting curved mirror and a partially transmissive flat mirror, the output coupler, which extracts some of the circulating laser light as the useful output. The gain medium is a laser crystal, which is side-pumped, e.g. Thousands of kinds of laser are known, but most of them are used only for specialized research. If you’re interested to find out more about different types of lasers and its applications follow this link. Solid-state lasers based on ion-doped crystals or glasses (doped insulator lasers), pumped with discharge lamps or laser diodes, generating high output powers, or lower powers with very high beam quality, spectral purity and/or stability (e.g. for measurement purposes), or ultrashort pulses with picosecond or femtosecond durations. Common gain media are: Nd:YAG, Nd:YVO4, Nd:YLF, Nd:glass, Yb:YAG, Yb:glass, Ti:sapphire, Cr:YAG and Cr:LiSAF. The term YAG laser is usually used for solid-state lasers based on neodymium-doped YAG (Nd:YAG, more precisely Nd3+:YAG), YAG is the acronym for yttrium aluminum garnet (Y3Al5O12), a synthetic crystal material which became popular in the form of laser crystals in the 1960s. YAG is a host medium with favorable properties, particularly for high-power lasers and Q-switched lasers emitting at 1064 nm. Definition: Laser which emits optical pulses, relying on the method of Q-switching. Q-switched lasers offer the only non-invasive, effective method for removing tattoos without scarring, plus treat other cosmetic issues such as fine lines, enlarged pores, pigmented lesions, vascular lesions, and toenail fungus. Because they cause minimal side effects and deliver reliable results, Q-switched lasers are the future of the aesthetics industry. Q-switching, or quality switching, of a laser, is a mechanism used to control the light output by concentrating all the energy into intense bursts or series of pulses by modulating the intracavity losses, the so-called Q-factor of the laser resonator. The technique is mainly applied for the generation of nanosecond pulses of high energy and peak power with solid-state bulk lasers. Laser devices that incorporate Q-switching are able to achieve selective photo thermolysis due to their high energy and short-pulse duration. This can be applied in the setting of removal of the tattoo pigment to arrive at the desired clinical results without much damage to the surrounding tissues and with relatively faster and uncomplicated healing time. The most common type is the actively Q-switched solid-state bulk laser. Solid-state gain media have a good energy storage capability, and bulk lasers allow for large mode areas (thus for higher pulse energies and peak powers) and shorter laser resonators (e.g. compared with fiber lasers). The laser resonator contains an active Q-switch – an optical modulator, which in most cases is an acousto-optic modulator. Figure 1: Schematic setup of an actively Q-switched laser. Pulse duration from Q-switched lasers typically varies between 100 ps and hundreds of nanoseconds. Medical practitioners take advantage of the fact that different wavelengths of laser energy are absorbed differently in human tissue. 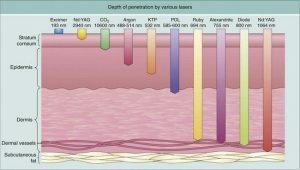 This is because certain targets (chromophores) in the skin can absorb specific wavelengths of laser energy without any damage to the surrounding tissue. These include water, melanin (the pigment that gives your skin and hair its color), hemoglobin (the compound that makes blood red), as well as hydroxyapatite (which is found in teeth). In addition, the inks in tattoos respond in a similar way to chromophores with different colors of ink, absorbing different wavelengths of light energy. 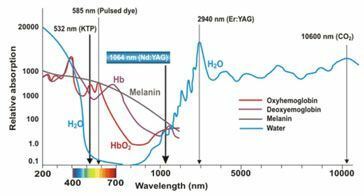 In general shorter laser wavelengths of laser light energy are absorbed most readily in pigmented tissue such as melanin and hemoglobin whereas higher wavelengths are principally absorbed by water and hydroxyapatite. Because of this thermal effect on chromophores lasers are increasingly used for hair removal (melanin), tattoo removal (inks) and for the treatment of birthmarks such as Port Wine Stains (hemoglobin). Longer wavelength lasers are increasingly being used for the removal of fine lines and wrinkles (skin resurfacing). Generally, at longer wavelengths, laser energy penetrates deeper into the skin. However, beyond a certain wavelength, the energy of the laser is instead absorbed by water in the skin. When this point has reached the water in the first live cell in the laser’s path will absorb the energy. This makes lasers using mediums such as Erbium ideal for skin resurfacing. When the laser energy is absorbed by water, the water in the tissue is completely vaporized. This causes the skin treated to shrink and shrivel stimulating the production of the new younger-looking firmer skin.